Meredith is currently putting the final touches to her training program before heading to Llandudno, Wales to represent Australia at the Commonwealth 24 hour championships. Ultra168 managed to track her down to a tiny village nestled high in the Swiss Alps, the highest permanently inhabited village in Europe. Tell us about your running background, how did you get to be where you are today? I started from the “couch” at 31 years old, in an attempt to offset the effects of a slowing metabolism. It was either start exercising, or reduce eating, the latter not being an option. 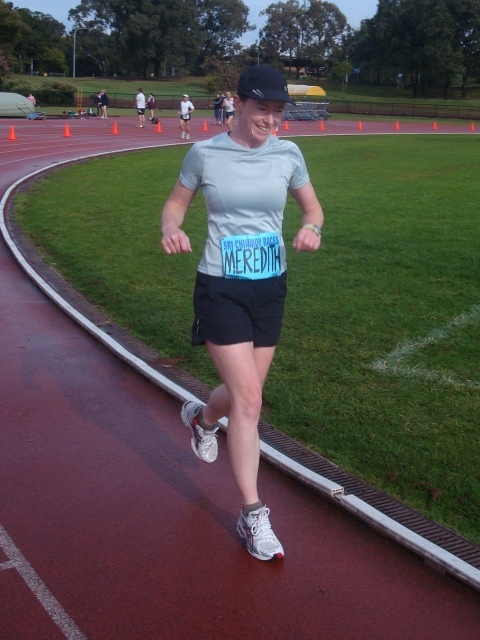 The first time I ran I could not make it around the oval, and I persisted in two 15 minute sessions a week until 6 months later I competed in my first 5km fun run (the now defunct Susanne Women’s fun run Sydney). I wore converse sneakers and ran it in 25 minutes. Despite having no real desire to run competitively prior to the fun run, I found the concept of having a goal a revelation and from there started to set new goals, like the half marathon in 5 months time. I also appointed a coach, a friend of mine Judd McBurney who was a keen 2:40 something marathoner within my friendship circle. From there I progressed slowly to marathons and it took 3 goes to finally get the much sought after 6 foot track entry qualifying time of under 4 hours for a marathon. It was not until The January prior to my first 6 foot track that I first entertained the possibility of being an Ultra Runner. I read Dean Karnazes’ book, ‘Ultra Marathon Man’ and I was captivated by the fact that a seemingly ordinary guy like Dean could run Ultra marathons – something I revered and thought way out of my reach. So from then on I plotted my way towards my first 100 miler, and this was before I had even done 6 foot. The next step after 6 foot was a 50 miler, so the Banana Coast Ultra seemed the best option, it was Grafton to Coffs Harbour, all on the road. I ran a nice even pace and came in about 10:15 for the 83km, but best of all found it much easier than expected. It was then I had really caught the bug and the rest is history. This time I have attempted to have 80km plus long runs each week, many of which were tempo sessions. Normally I would consider 60 or 70km adequate, but news from afar (i.e. Andrew Vize telling us of the runners from the states) indicated that longer long runs were the norm. I think Ultra running is still in its infancy here in Australia, despite having a surge of popularity in the 80s. Since much of the theories of marathon running are thrown out of the window with Ultra running, I feel like an experiment of one to a certain extent. I have also incorporated a 20km hill/speed session each week which is new to the training week, along with two weeks of altitude training prior to the event in the taper. Marie and myself (Marie will be competing for England) are staying in Europe’s highest village that is inhabited all year round. It’s a great opportunity to catch up on sleep and do some quality training in what I find a difficult environment to breathe whilst running. My goals are to run my best on the day – so at least over my personal worst of 200km. ideally anything in the teens would be acceptable, and if everything goes right I think I am capable of 220km. What advantages do females have over males and visa versa? Women are generally more conservative when starting a race, which is imperative when running ultras. All too often I have seen faster males runners set out at 15 hour 100 miler pace and then they wonder why its a struggle to get under 30 hours. Women quite often are more insecure about their abilities to achieve physical goals and therefore train longer and harder to make up for seeming deficiencies in the lead up to a race. Not sure if that is simply a product of society’s expectations, but I think it sometimes comes to play when comparing the genders. Obviously there are plenty of guys that train harder but there are also plenty of guys who grossly underestimate the preparation required for ultra distance events. From what I have seen in the GNW 100 miler over the past few years, women seem to have an uncanny knack to deal with the heat much better than males. Perhaps it is simply due to the fact that they sweat more, not sure. However, men are naturally faster statistically and are not as prone to stress fractures that relate to a lack of calcium like women. Men quite often have less time pressures for training than women. Many women have less available time for training if caring for children and running households. A typical training week will be 4 am rise out of bed to walk my poor dog around the block, and then drive to work before completing a 20-30km run before work. I generally do a 20km hill session once a week, an 18km power walk, and the rest is just running . Long run on either Friday or Saturday, and a back up 30km run before or after the long run to emulate the tired mid race feel. It ends up as about 26 hours training, and about 5 hours of eating weetbix – Some days I can eat up to 20 much to the amusement of my work colleagues. What is the Aussie Team like? The Aussie Team is fairly strong considering our population. Our captain Jo Blake who has been in all the previous Australian teams I have been on is a very competent 245km runner. We have John Pearson, Anth Coutney both previous competitors, and this year two new guys Dave Kennedy and Rick Cooke. The Girls team has been very strong, with a Bronze medal at their 2010 debut at the world championships. It was headed up by Sharon Scholz who did an amazing 29km PB to gain 6th place overall female at 224km. Then there was myself who managed a 16km PB, and placed at 9th overall .Third was Susannah Harvey Jameison who did a 3km PB to reach 212 and gained 12th place overall. Allison Lilley also on the team but who had to recently pull out due to injury has also been a consistent performer gaining 190km at Brive. What do you eat drink during your races, are you a solid or liquid fuel runner? How has that evolved over the last couple of years? I am a solid fuel runner generally although have gravitated away from sandwiches and Bars to gels and shot blocks. I find the organic options best such as Cliff shot blocks and the Honey stinger range of products as it seems the more natural the intake the less of a junk food hangover. I am sure there is plenty of room for improvement in what I eat and drink, for instance other than the odd avocado sandwich I do not have any protein. Tell me about these MQ “Nails” quests you do? Is there a lap of the land coming up? I think being very fit is a great tool to enjoy and allows so many exploring opportunities you can’t always get by driving, so thought that I’d put myself to the test and run to Coffs Harbour in 2010. After 4 days unsupported, staying in pubs and motels I was joined by good friend and training partner Marie Doke, who met me in Gloucester and ran with me to the end. Her Husband was kind enough to support us through to Armidale, which made it much easier as there are a couple of sections there that have no public water available, and the farm houses are set far back from the road. The trip ended up being 692km, and Marie and I caught the plane home to Sydney which amused us no end that it took a mere hour or so to get back to the start of a 10 day journey. I was also starting to battle with injury on day 6 of 10 days, so their encouragement and support prevented me from cutting it short and catching the train home from Armidale – the point of no return. Poor Marie had a very slow partner by the last days of that run and her persistence ensured I finished. I learnt so much through that adventure, mainly that the human body is capable of amazing things day after day, and eventually it gets used to a 70km day back to back. The second thing I learnt was that long runs are never going to appear that tough after all, not when you only have to do one a week instead of 7. The third thing I learnt was the joy of simplicity .It was just run, eat drink rest. And did we enjoy the little things – an open general store, a small town on the journey was met with great anticipation and excitement, and a 2 star bed with bathroom – pure luxury. You just can’t appreciate things enough until they are denied. I think we need to continue sending teams to the world championships to ensure a healthy top end of the sport. This will ensure that runners continue to push the barriers in their efforts to be selected for the teams, and the profile of the sport generally has some chance of being increased through international competition. The biggest barrier to this happening is money, ultra athletes in Australia are largely self funded, and it’s an expensive exercise to get to the European and American events. Ideally if some government funding was available it would oil the wheels somewhat, not to mention private sponsorship, both easier said than done. Natural speed would be nice! We wish Meredith and all the Australian team the best of luck for her race look forward to chatting with her in the future. Spud and Bluedog once said “It’s amazing what a bit of training can do”. MQ’s training is meticulous and overall volume is eye popping. Good luck MQ. Amazing focus and determination. You deserve all your success. MQ reports that the weather has been a bit wet, but she is “ready to race”. Give it some MQ – we are going to be jumping on the couch cheering for you this weekend.